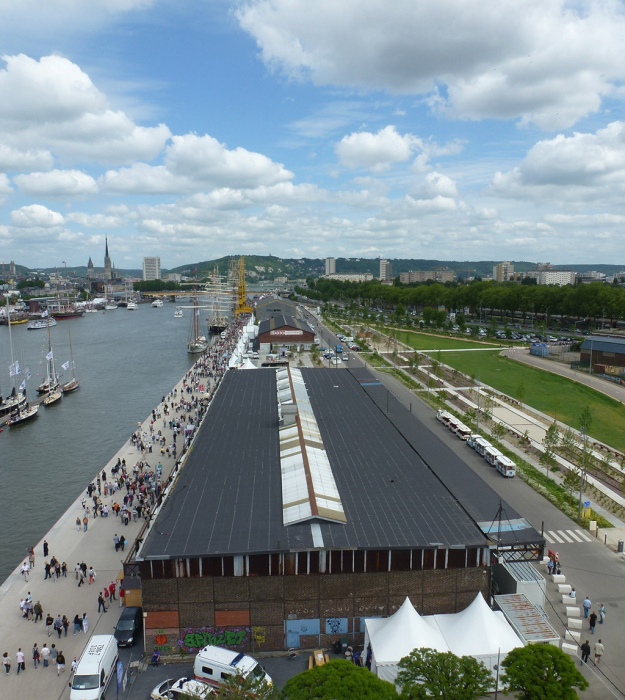 The project stands on the site of hangar 108, on the south bank of the Seine, near Rouen city center. 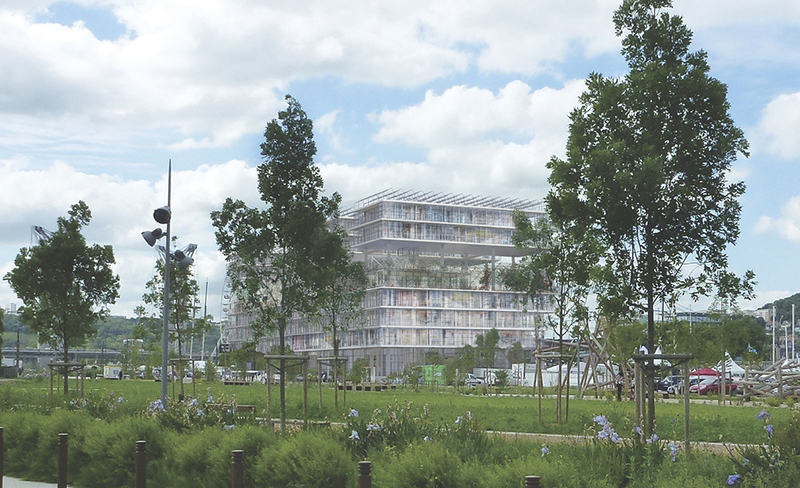 - the creation of the Flaubert eco-district in the south, embracing ambitious environmental goals. 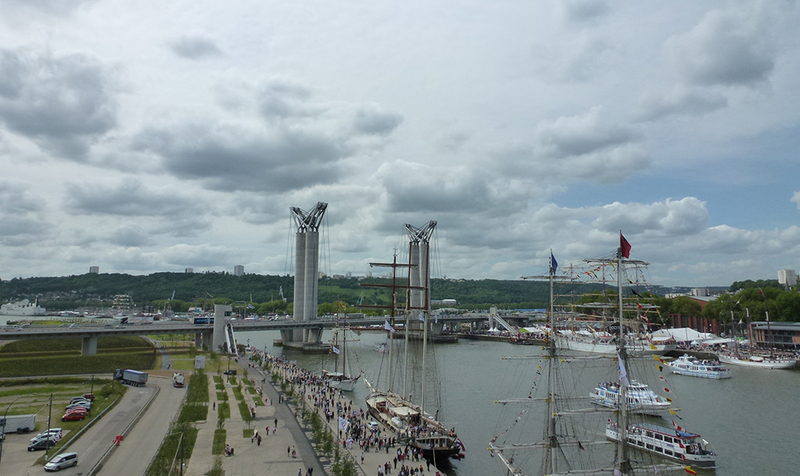 - the natural spaces along the Seine, in the junction of the docks and new gardens with the future canal that will formulate the eco-district. - the existing freeway, railroad and harbour infrastructures, that shapes the landscape by its scale. Their activity is in mutation, these spaces call to be reconsidered. This geography characterizes a remarkable site. The building consolidating the CREA departments integrate into this post-industrial and natural environment.
. 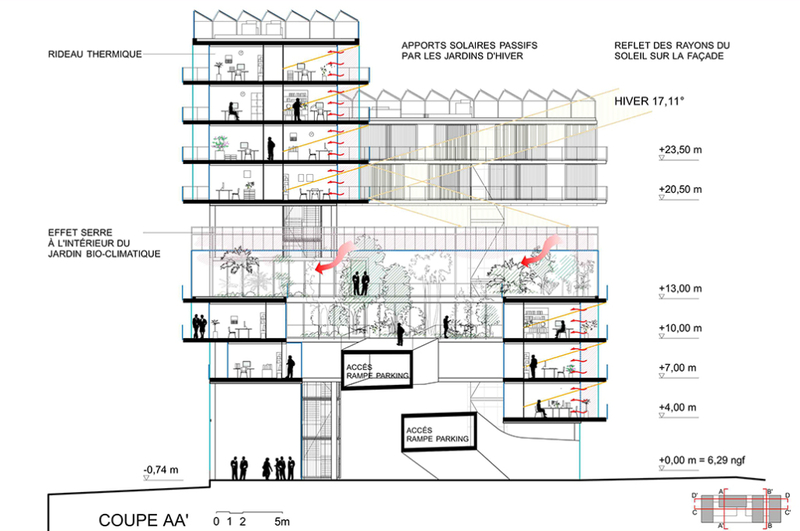 The general implementation echoes the size of the surrounding harbour buildings and hangar 108, and occupies the entirety of the available plot surface, as well as the various authorized successive overhangs.
. The building is composed from a big rectangular, solid base, that makes the "base" building, and in which houses the access, the car park and a part of the offices. 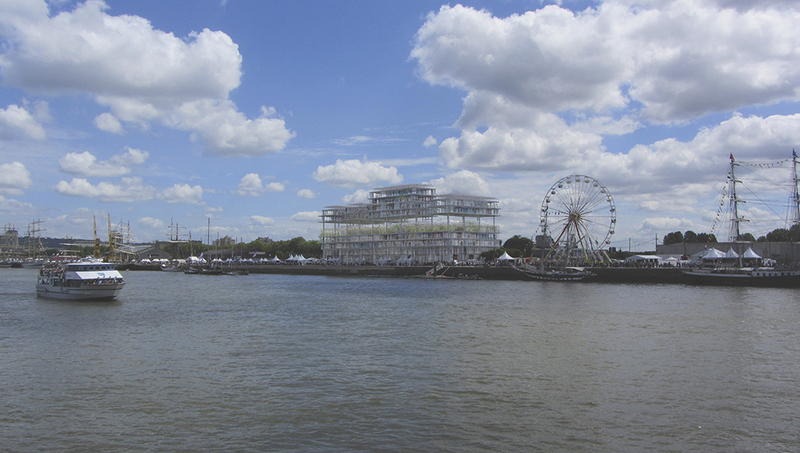 It creates a 13 m-high volume that takes the shape of the dock sheds.
. 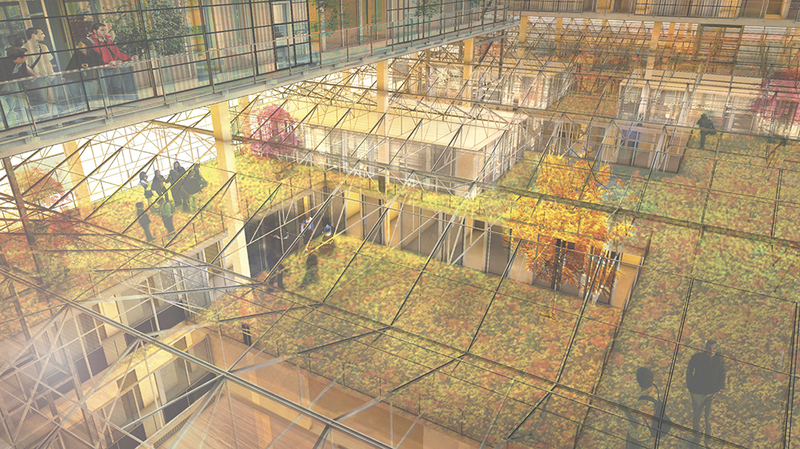 Above, a part of the program is developed into small "block" buildings that make the "signal" part of the building.
. In-between these two elements, a garden sheltered by a greenhouse defines an internal street that structures the project and circulation creating an important space for collective life. It hosts the main meeting rooms and catering spaces in a central location for all the offices and services.
. This garden fill the function of the ground floor, that, so freed, creates a substantial available hall accessible to the dock and the new promenade. The program for the grouping of the CREA departments mainly consists of flexible offices, some meeting rooms and common spaces. The building is also open to the public. 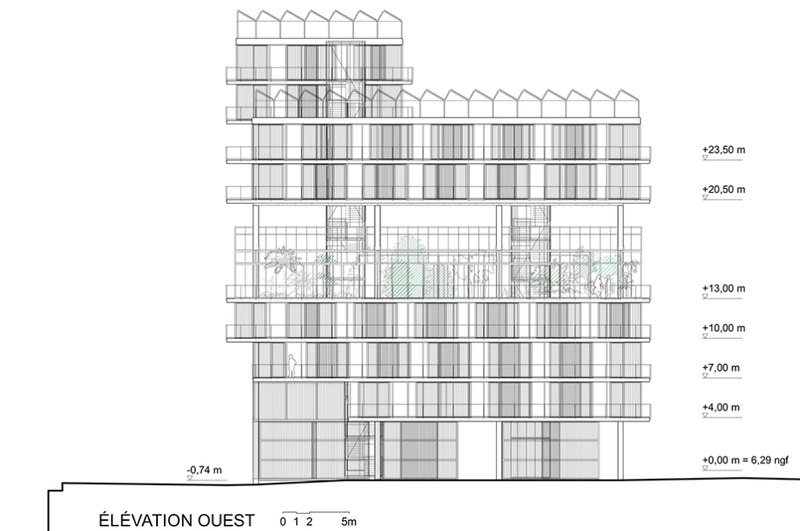 On the ground floor, the project occupies the whole plot to create a double height hall. 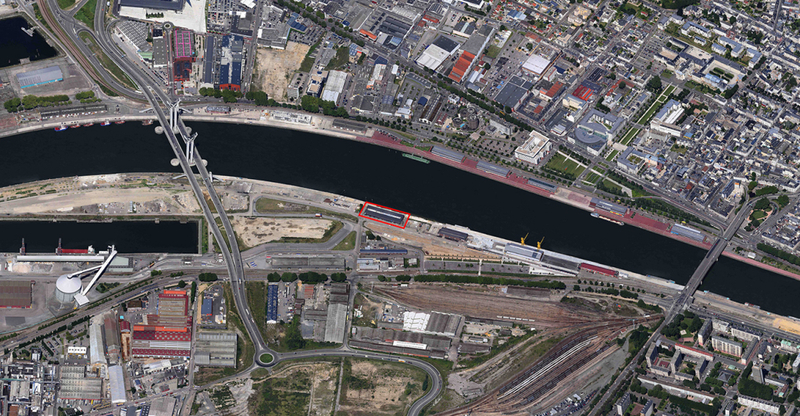 The existing slab is kept, allowing the organization of entries from the dock 'Jean de Bethencourt' level, towards a strip of technical facilities and car parks. 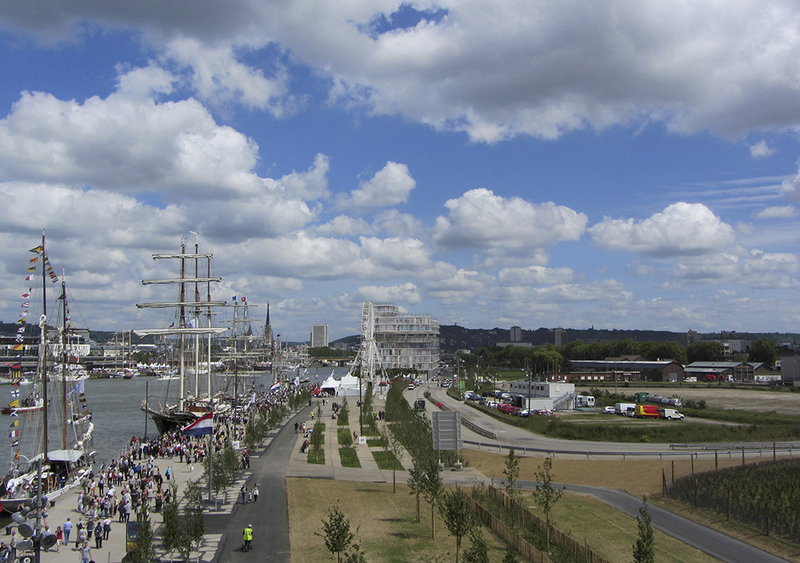 Secondary access to the hall is organized along the Jean de Bethencourt path on the river side. 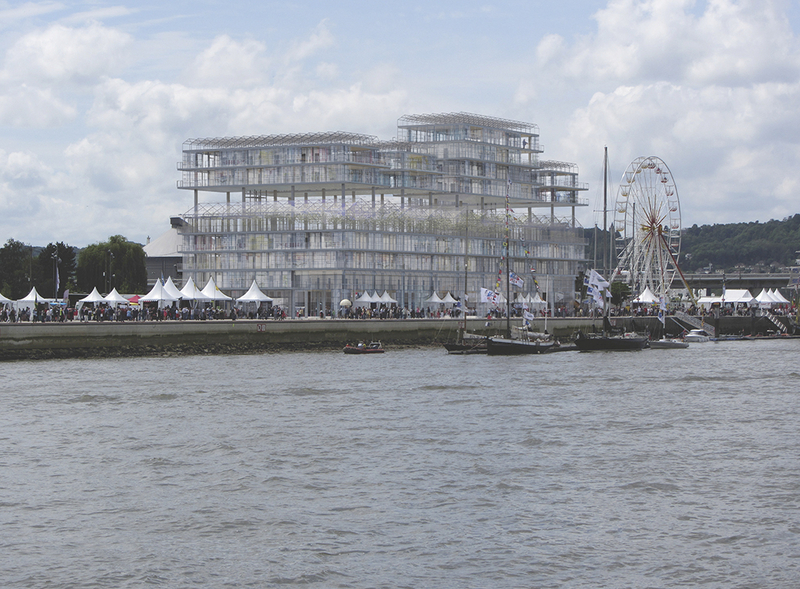 This hall of approximately 7m of free height will be enveloped by light, transparent and openable walls (sliding polycarbonate panels), allowing continuity towards the Seine and the future canal. The offices are located on the 1st, 2nd and 3rd floor peripheries. They benefit from a completely glazed facade made of sliding frames, a winter garden and a balcony. The parking is located on the 2nd floor, between the offices. 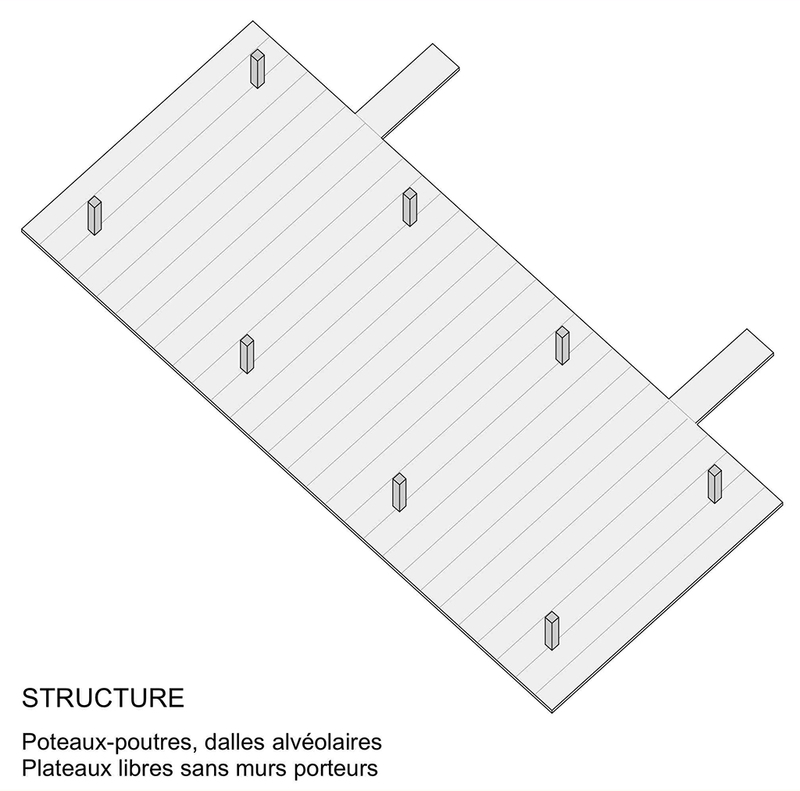 The 3rd floor roof supports planted patios, around which are organized other offices and transverse circulation. The 4th level is composed of a garden under a greenhouse, in which the main meeting rooms and catering spaces are located. These common spaces thus benefit from pleasant surroundings and great views from the terrace to the Seine, the city center and on surroundings. These meeting spaces can extend into the garden. The users can also lunch in the garden beside the rooms dedicated to this use. This makes a real elevated internal street - a new tier that amplifies the ground floor level. Placing these functions in the garden rather than the ground level confers to them a critical intimacy and tranquillity. Above the garden roof, three 'block' buildings stand transversely on the 5th and 6th floor, the fourth one stands along the north facade and reaches the mezzanine above the 7th floor. The 'blocks' are connected by footbridges. 4 glazed stairwells stand between the 'blocks', perpendicular to the footbridges and egressing on the pedestrian ramp or in the hall, on the ground level. Their frame is used to brace the building. The main set of elevators stops at all levels. 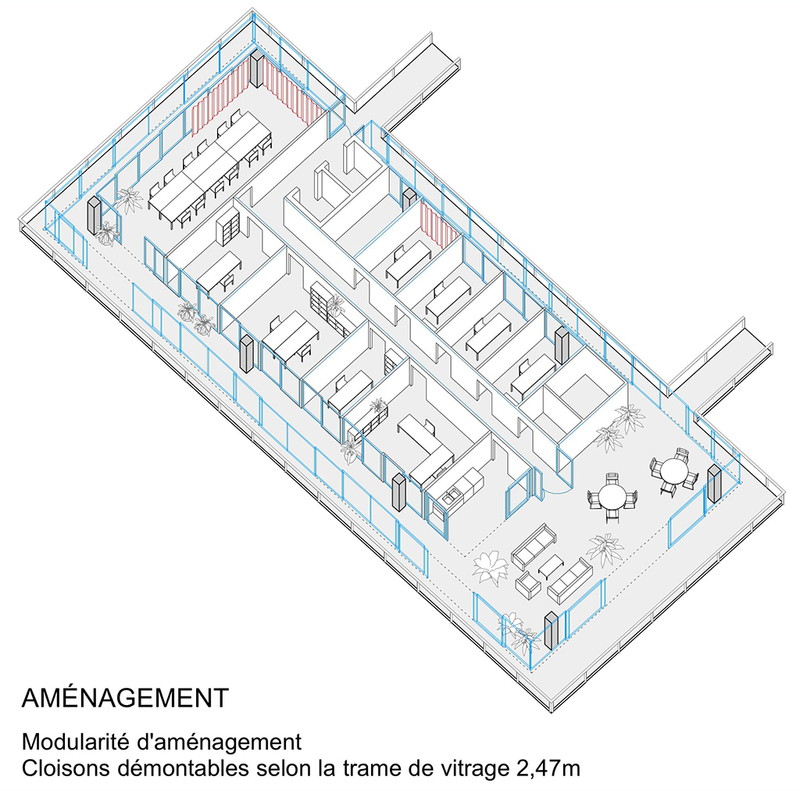 A separate elevator is located perpendicular to the technical accesses and serves logistics.
. 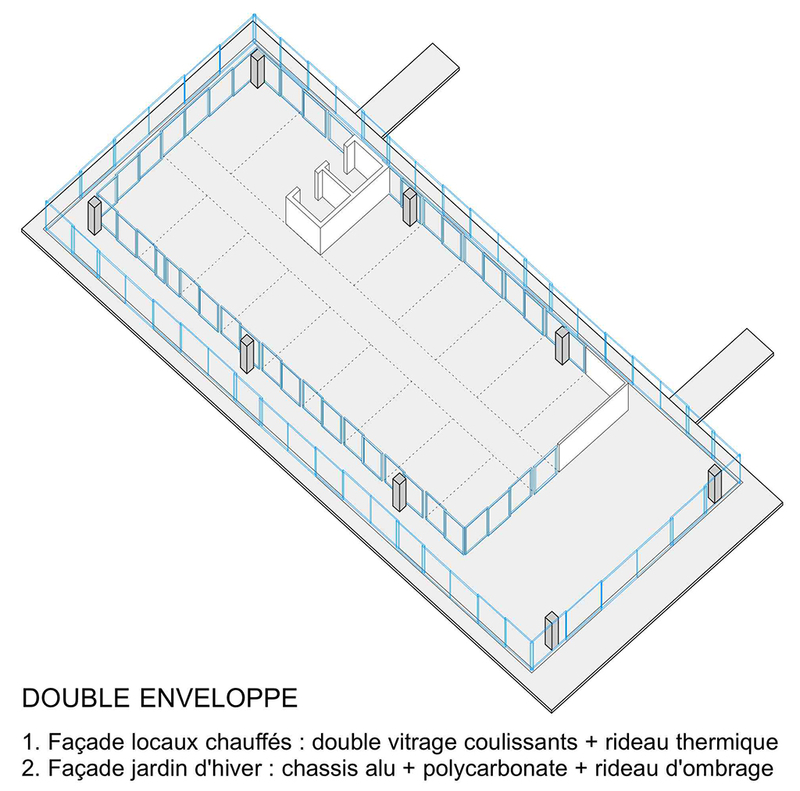 The facade device created by the double envelope includes a set of successive walls of different types. Each wall has a specific spatial and technical function. 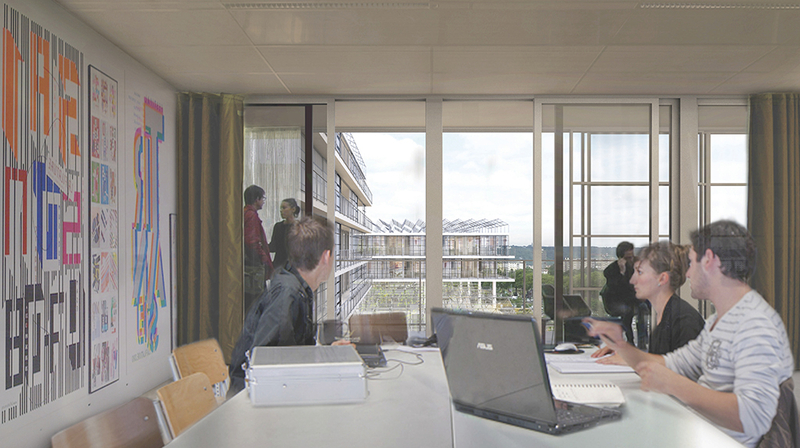 They define a series of filters which can be activated separately to define comfort, views, transparency, luminosity and ventilation.
. a internal thermal curtain, behind the window.
. a space of variable width (1,2 m to 2,4 m) creating a thermal buffer zone all year round that extends the office space - a useful and pleasant "private" winter garden.
. an outside facade opened by sliding panels covered with a simple, transparent polycarbonate skin . 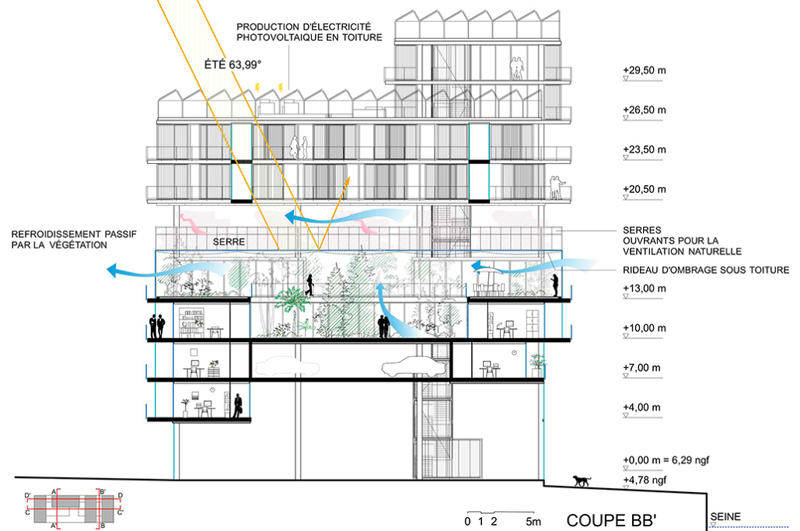 The project enables the developement of two spaces strongly favoring the life of the building and its public activity, namely, the ground level and the garden space on the 'base' volume roof. 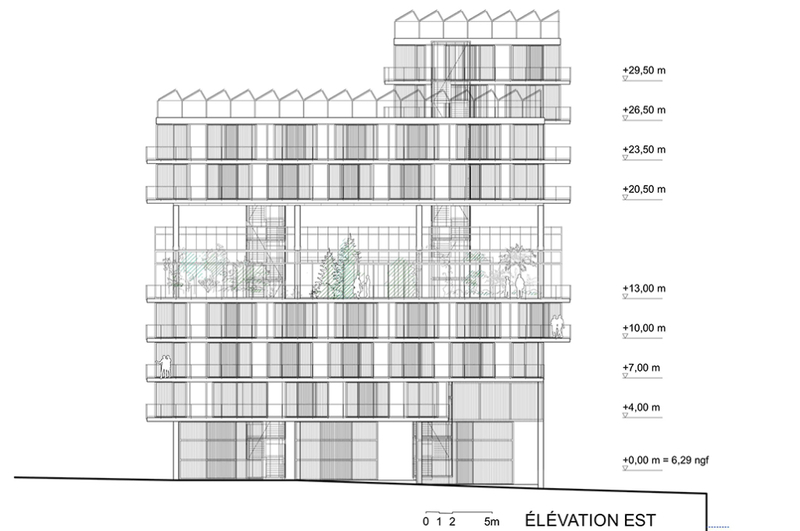 These two spaces - ground level and garden - respond to the exceptional location of the building on the edge of the Seine. They constitute additional spaces, as do the winter gardens, that greatly extend building capacity and the range of use.